Camping furniture is as versatile as camping itself. There is a huge selection of camping tables and camping chairs for campers to choose from, from low budget expeditions to the more refined "glamping". There are enormous differences in the construction and quality of said products, especially when it comes to weight, packed dimensions, price and product life of individual pieces of camping furniture. Depending on the make of the camping chairs, they will either fold down flat, which is often the case for garden chairs, or the poles can be collapsed lengthways. Both designs have firmly attached poles, seat and back padding. Unfolding and packing away camping chairs is therefore very quick and easy, and the camper can't lose any pieces, as they are all firmly attached to the chair. When selecting the perfect camping chair, it is important to consider the type of travelling you are doing and what space you can spare. Some chair models can be folded down very small and transported in their practical integrated bags. If you have enough space and are not expecting to be manually transporting much of the time, then you can certainly opt for heavier and less portable camping furniture. But even when it comes to fishing chairs or camping furniture that only needs to be transported from one camping spot to the next, a few hundred grams really can make a big difference in your baggage. Outdoor specialists like Leki, Helinox and Relags know what a camper needs to comfortably camp in the wilderness. Lightweight folding stools are a great seating option for trekkers who like to save on every gram they can in their backpacks. Folding chairs and collapsible chairs come with and without armrests as well as padding, drinks holders and carry bags with straps. Heavier camping enthusiasts should take a quick look at the recommended max. user weight on the camping chair. Not all models are made to hold heavier people, and especially cheaper models can easily bend and break after a short period of regular use. The seat height should also be considered. 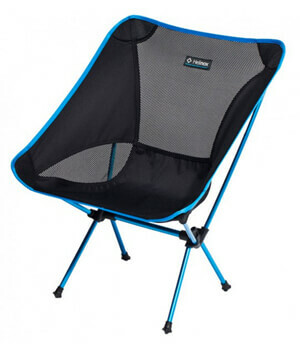 Some camping chairs have a very low seat height and are best for sitting closer to the ground with half extended legs. Others are then made the perfect height for sitting up straight at camping tables.